Sometimes I don't know who I am anymore. Sometimes I find myself doing such bizarre things, that I am pretty sure that I've gone to sleep in one world and woken up in another. Like last week, I found myself in Hawaii with my ex-husband and our kids. Not getting back together, just finding a way to vacation with the little people we love most, able to be mature enough not to have it mean anything more than it did, no story, no strings, and no cares what stories other people could whip up. Then there was my dolphin summoning. It was supposed to appear right in the line of the sunset. I wanted to summon it, because I thought I could. I didn't think wouldn't it be nice if, I thought this is possible, and I believed it with every part of my being. I let go of it actually happening, however, not wanting to feel attached. In other words, I slept on it. The next day, my ex found me and told me that there was a whale and her baby taking a stroll across the waters. I ran out with my youngest daughter, watched a few spouts of ocean droplets and dancing fins. Then I heard a little boy, who just arrived on the scene, speak out nonchalantly. "Aren't they over there?" He was pointing in the line of the sunset. "No," his parents said, "way over there, where everyone is looking." "Oh, yeah, those are dolphins." said the Universe masquerading as the boy. And my gaze shifted back toward the sunset. While everyone ooohed and awwwed over the whales, I kept my eyes focused to see a dolphin. I waited several minutes. It was worth it. 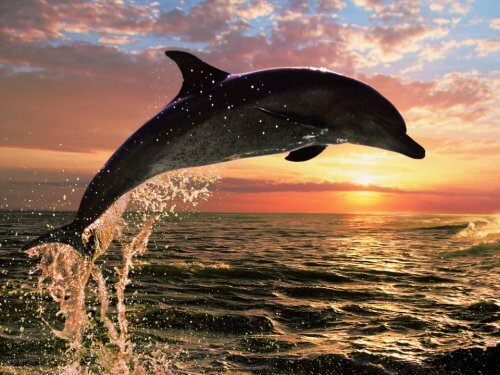 Suddenly, out jumped the most gorgeous dolphin forming a graceful arc of its body and landing back in the water. There wasn't another one. That was it. I broke the family curse too, which has been for years that everyone sees a sea turtle in the wild but me. My curse held steady until the last day. But when I geared up for the last time, I knew this time was different. I swam out a good distance and paused for a moment, only to see a gorgeous sea turtle making his way toward me. Not only did I see this beautiful creature, I swam with it for a long while. I watched how slowly and gracefully he moved. I became slow like him. Despite being a good snorkeler and telling others around me about him, nobody else could seem to track it but me--like it was my own personal turtle swim, not meant for anyone else. I was gifted this beautiful creature, and back home this morning, I feel him with me. I slow down to see the beauty right in front of me. My family joked that now there was no more curse to tease me with. I responded, "Yes, that is right. Things are different now. I am a chosen one." I am a chosen one. I do not say this to set myself apart as greater in any way. I say this to declare that for the first time in my life, I feel worthy of being a chosen one. We are all chosen. We just have to discover this. Yes, I hardly recognize myself, but that is okay. It is delicious to discover this new woman. There were moments she knew such quiet, sitting under the stars and the moon, that she became one with all of the elements: the earth that held her, the April air that blew fiercely around her, the fire of the torches burning into the night, and the vast ocean of water, the womb of other worlds, of other possibilities. There was nothing to separate--no extra baggage weighing down. There was nothing to keep her from experiencing. Mostly, there was no fear, and in this opened up an entire new way of partaking of the present moment. So, I come back, still lit up from the tropical paradise, feeling the contrast of experiencing while being clear and open, stripped of fears and limiting beliefs, illusions of separation; humbly gifted the extraordinary and able to receive it. I am humbled by a profound love of self, and a woman who decided that she wanted to really live, to really see, who couldn't be content any more just watching it all go by, unnoticed. Whew. Such gorgeous writing, so perfectly expressing it all. What a beautiful image, what beautiful words to find in my mailbox this morning. I am so glad I subscribed yesterday. I would not have wanted to miss this inspiring post! This is so beautiful Brooke. What amazing clarity about your value. I love it. The dolphin summoning would have made me cry for sure.